How will your employees collaborate? One of the upsides to having everyone together in the same room is that this type of environment breeds collaboration among workers. Onstream Meetings, for example, makes it possible to exchange and edit multimedia in real time over a shared screen, while communicating via text, audio and video. Using the platform, your employees can collaborate as if they are sitting right next to one another. How will you protect your sensitive data? Don’t risk transmitting sensitive information (i.e. payment, contact, personal health or any other form of private data) over the Web without taking the proper precautions. 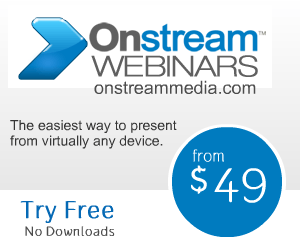 Invest in a secure, cloud-based Web conferencing platform like Onstream Meetings that will encrypt your information and transmit it over a private, hosted network. How will you meet as a team? Just because your team is spread out doesn’t mean you have to stop communicating as a single team. Using Onstream Meetings, your whole department can exchange ideas in a group-wide conference. Onstream makes it easy for a single user to moderate a meeting, so that everyone can have an equal shot of speaking. And with the help of a full content library, moderators can easily share files with the group as needed without having to disrupt the meeting by searching endlessly for specific documents. Click here to learn more about how Onstream Meetings can help facilitate telecommuting in your enterprise.